I’m right proud of my son. We just finished up a rough two week stretch. First we traveled about 750 miles round-trip to Pennsylvania for their homeschool convention in Harrisburg. In the past, we have had at least one of my daughters along to help staff the booth in the exhibit hall, but this year they are both finishing up the quarter in college. So we had Josh with us, but no one else. He really rose to the challenge. When we got there, I told him to size up the booth space and figure out how he wanted to set it up. He studied for awhile, then came up with a new layout, which worked out quite well. He was very attentive to customers, was aware of when a product display was getting low and restocked it, and ran the cash register. He never complained, and was always pleasant and eager to talk & answer questions. We were home for a few days, before driving up to Lansing for the Michigan homeschool conference. This was even more of a challenge, because I miscalculated the drive time, when we had to arrive and how much time was required to set up before the opening of the exhibit hall. In short, we had to leave much earlier, and then had much less time to setup. Josh was a trooper, and worked hard to get everything in place. Later, Melinda was presenting three workshops. Since I am her road crew, we were both gone for long periods of time assembling the laptop & projector, then clearing out of the hall for the next presentation. Through it all, Josh manned the booth and ran the whole show. We traveled another 500 miles on this trip. He never complained once. When we got home, I did the accounting, prepared the bank deposit and called in the charge slips. Josh didn’t make a single error. But the real thing I loved about the last two weeks, was how many times I saw parents of kids who struggle listen to Josh and gain hope. Josh had a rough time while he was growing up, but he is a fine young man now. He is compassionate, caring and polite. He has been able to overcome and compensate for most of the challenges he has faced. And we have found an outlet for his talents. He has finally completed one of his novels, is close to completing a second and has several more in various stages. He has ideas for thirty more stories or books. It is an inside joke between Melinda and I that because Josh is the subject of so many of her stories, he has become as popular as a rock star to her audiences. After seeing Josh interact with them, I think that maybe we are underestimating him. We have some new events that we have added to our schedule at the last minute. My son, Josh, is an introvert. In many ways, this is a blessing. It means that he’s not necessarily lonely just because he is alone. He is comfortable being with himself, and by himself. He also likes people, and enjoys spending time with them. It’s just that socializing is not a pressing need for Josh, and it drains his energy after awhile. From a very early age, Josh struggled with social nuances. He didn’t feel the need to make eye contact, and his facial expressions often gave no clue as to what he was thinking or feeling. He had to work to learn to read body language, tone of voice, facial expressions, etc. It did not come naturally for him, and the effort he exerted often yielded small returns. Here is just a glimpse of what he experienced as he grew up. Imagine trying to say the right thing, and using the correct words, but still being rejected because somehow you said it wrong and offended someone. Imagine going up to a group of children and asking if you can play with them, only to have them ignore you and run away to play with each other. Then watch as within moments another child approaches the group and is instantly included in their play. You don’t know what you did wrong. You tried to do as you had been taught. You realize that somehow others know things about interacting and making friends that you don’t know, and these secret rules are frustratingly out of reach. How should you proceed? An adult shows interest in you and says you are friends, so you invite her over to play and she gives you an odd look and goes to talk to your Mom. Other adults seem to do that a lot, and Mom just looks sad and kind of baffled. Doing what came naturally to you didn’t work. Using the social skills you rehearsed and practiced with your Mom didn’t work. Your Mom seems to be the only real friend you have, and while you’re appreciative it’s still hard not having friends your own age. Real friends, not like the forced ones in the group your parents have to pay for you to attend, with other kids who don’t really get the unwritten rules of social skills any better than you do. You want friends, so you try and try again. You’d like to think of yourself as optimistic and resilient, but others view you as a pest who can’t take a hint. What hint? They never actually came out and said anything, so how are you supposed to know what you are doing that bothers them? Or maybe it’s something you are not doing, that they think you should be doing. It’s all so confusing. People say you are too blunt, but you say things as you see them and are truthful. Others talk around the point, but never just come out with it. Maybe they don’t want to hurt your feelings, but it hurts more when things build up and you don’t even realize it until it’s too late and you’ve lost another potential friend and truly don’t understand what went wrong. Sure, you have proximity friends. Those people who say hi to you and ask how you are. By now you’ve learned they don’t really want to know how you are so you just tell them “fine”. That’s how people do it, right? You join a small group of other guys at your church, thinking the smaller group might help you actually develop relationships. You care about these guys. But although they spend time with each other throughout the week, you are rarely invited to join them. You plan something at your house and invite them, but they all have excuses why they can’t make it. You’ve been told you are intelligent, kind, caring, and creative. But somehow a “weird” or “quirky” vibe seems to trump all that. Gradually you come to accept that the true friendships you develop will be rare, and you will treasure them at a deeper level than those for whom relationships come easily. You will enjoy your proximity friends during those brief interludes when your paths cross. You will continue to make attempts at speaking the social language of those around you. It will always be something of a mystery to you, why some reject you and others will be friends. You learn to appreciate the friends without having to understand the reasons why. Some people allow you to show just how much. I’m weird, you’re weird, we’re all weird now! I am notorious at reading too deeply into simple statements, but this struck me as profound. Beth: Hey, I don’t like the sounds of that. You are not a stupid-dumb head! M: I know, sometimes I say things like that. Beth: Well, I don’t like those words. They aren’t true. And I bet your mom doesn’t like them either. Beth: If I mentioned to her that you said that, would she be sad? M: Don’t mention it to her, okay? It doesn’t mean anything. You don’t have to mention it. Beth: I just don’t want you to say those things about yourself. I like your head. I want you to like your head too! M: Okay… I’m just weird. M: Yeah. I’m weird. You’re weird too. Everyone is weird! M & Beth: BEING WEIRD ROCKS!! What makes this profound is my buddy in this story has Asperger’s syndrome. He is a quirky boy, and fitting in isn’t always easy. However, strides have been made, society has come a long way. Self-confidence and self-love is a rare find in individuals such as these, and it warms my heart to know that these kinds of children can proudly scream “Being weird rocks!” in place of being a “stupid-dumb head.” Having a difference can be isolating, and it’s encouraging to know that not only can people cope with this, they can be proud of their differences too. We still have so far to go, though. However, I do think it’s important to celebrate these small steps, for they are significant. My son, Josh, and my youngest daughter, Beckie, both have auditory processing difficulties. Although when they were officially evaluated by an audiologist they had some differences in the auditory tasks in which they struggled, they both demonstrated poor working memory. This means that although their hearing acuity is fine, they process the incoming auditory input in an atypical manner and they are unable to hold information in their minds long enough to remember it all and act on it. So they might remember the first thing they heard, or the last thing they heard, but if it’s a long segment they are likely to lose information. I used strategies like pairing visual information with auditory information, and I utilized gestures and demonstrations nearly all the time. I had them look at me before I gave them directions. I had them repeat back to me what they heard so I would know if they were not complying with me or if they never got the information in the first place. This is an important strategy for parents and teachers, because you should not be disciplining a child for not doing what you’ve asked if he never received the information completely in the first place. I also did activities specifically to work on improving auditory memory and attention. One activity I did with all my children was have them repeat back exactly what I said to them, increasing the length of the segment a little at a time. For example, I would say something like, “The cat walked to his bowl.” We would practice that until they could say say it verbatim. The next sentence would be, “The white cat walked to his empty bowl.” The next sentence might be, “The white cat slowly walked to his empty bowl, hoping to find it full of food.” This stretched their attention span and challenged their auditory memory skills a little at a time. I also reminded the children to make a mental picture about what they were hearing, since the internal visual cues would help them remember details. One day, while doing this activity, I noticed that Josh was tapping himself on the temple every time I started with, “Ready? Listen to this.” I thought to myself, “Great! Now on top of the AD/HD, sensory processing difficulties and auditory processing problems, I’ve given this kid tics!” I wasn’t sure I really wanted to know the answer, but I finally asked Josh if he realized he was tapping himself on the head every time it was his turn to repeat something. He promptly said, “Yes! I’m turning my recorder on!” My little hands-on guy could relate to pushing a button to record something, so he had implemented a tactile strategy for himself. (Whew! Big sigh of relief for me since his head tapping wasn’t caused by tics after all and I hadn’t done anything to cause them or mess up my kid!) Once a child comes up with their own strategy, we can use it knowing that it makes sense to them. After Josh showed me that he identified with “turning the recorder on” I generalized that strategy for other listening tasks. When teaching any subject, I would prompt Josh to turn his recorder on because the next point was very important. Before giving him a multi-step direction, I would prompt him to turn his recorder on and picture himself doing the task. His strategy became my strategy with him, because Josh taught me something that worked for him. Geography: She’s having none of it! I’ll admit that I’m not strong in geography. I have a feeling that my children learned as much from the PBS show “Where in the World is Carmen Sandiego?” as they did from me. But I’m o.k. with that. As long as they learn it, I’m happy. I do have some good geography materials by Cindy Wiggers, and I made it through all of the U.S. Geography book with my children. At least at one time they could name the states and capitals, and they know how to label mountains and rivers on maps. My daughter Beckie and I are currently working on world geography. I am learning it along with her, since if I ever knew this information the files must have been deleted somewhere along the way. (When this happens, I blame one of the car accidents I’ve been in for killing off some brain cells. They’ve been minor accidents, but I think whiplash and trauma might have messed with my brain for stuff like geography.) 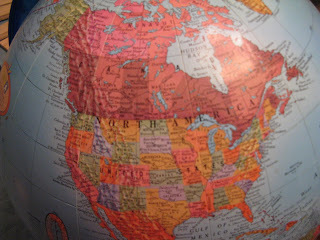 While we were learning about North America, we pulled out maps and had the globe in front of us. I would ask Beckie to locate various landmarks, oceans, etc. Following along in my curriculum instructions, I asked Beckie to find Nunavut. Beckie, whose AD/HD manifests in both a short attention span and a tendency to blurt things out, is not good at hiding her frustration. She glanced at the globe for a few moments, then informed me that she didn’t see “None of it”. Ah…and did I mention she has auditory processing difficulties as well? Being the adaptive instructor that I am, I showed her the spelling of “Nunavut” and encouraged her to look pretty far north on the globe. With that support, she was able to find it but continued to tell me that she could find “None of it” for several other items that day since she was amused by her own misunderstanding and pun. At least she’s having some fun during a subject that does not hold her attention easily.